If NHL games were only 40 minutes long, the Coyotes would be 2-0 and everyone would be praising their quick start. Instead, two blown leads find the Coyotes 0-1-1. 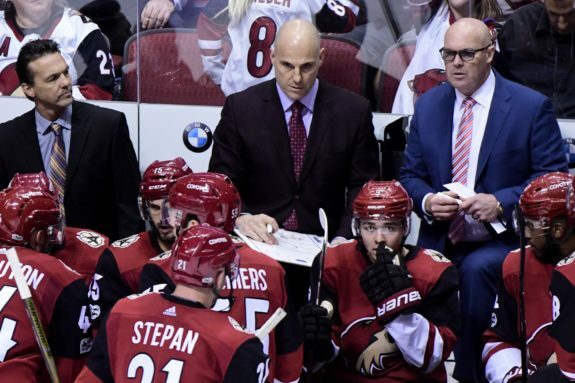 Last season, the Arizona Coyotes were 19-0-4 when leading after two periods. The Coyotes opened their season Thursday in Anaheim and held a 4-1 lead after Christian Fischer deflected a Brendan Perlini shot for a power-play goal with 6:10 remaining in the second period. The Ducks then scored four unanswered goals in regulation to defeat the Coyotes 5-4. ”It’s a learning lesson. It’s a tough one, because that’s a game we should have had.” Head coach Rick Tocchet said after the game. Saturday night in their home-opener against Vegas, Arizona nursed a 1-0 lead until the Golden Knights pulled their goalie and scored with 1:12 left in regulation. Vegas went on to win in overtime. In the Anaheim game, the young, inexperienced forwards played well. Clayton Keller scored his first career NHL goal. Rookie Christian Fischer, along with Max Domi and Anthony Duclair also scored. The problem was their veteran defenders. Turnovers by the Coyotes defense led directly to every single Ducks goal in that game. Niklas Hjalmarsson’s errant pass was intercepted by Rickard Rakell, who quickly sent it over to Corey Perry. Hjalmarsson then took himself out of the play, merely waving his stick at Perry, as he cut to the middle and scored Anaheim’s first goal. Ekman-Larsson turned the puck over and then couldn’t get back in time to defend Perry for his second goal, which started Anaheim’s comeback. Kevin Connauton, who is filling in for the injured Jakob Chychrun, fumbled a bouncing puck at his own blue line, which led to Anaheim’s third goal. A blind pass around the boards by Alex Goligoski directly to the Ducks accounted for their fourth goal. Jason Demers then had trouble with Andrew Cogliano’s forecheck, and goaltender Louis Domingue’s glove hand whiffed on a shot from Rakell, cementing Arizona’s collapse. Anaheim had 41 shots in that game. On Saturday, the Coyotes surrendered 42 shots to Vegas. Another issue troubling the Coyotes early in the season is puck possession. Against Vegas, Arizona won just 39.3 percent of faceoffs, including just three of 21 in the first period. In Anaheim, they won only 42.9 percent of faceoffs. Keller, a winger, is the only Coyotes forward to have won more than half of his faceoffs, and he’s only taken two draws. 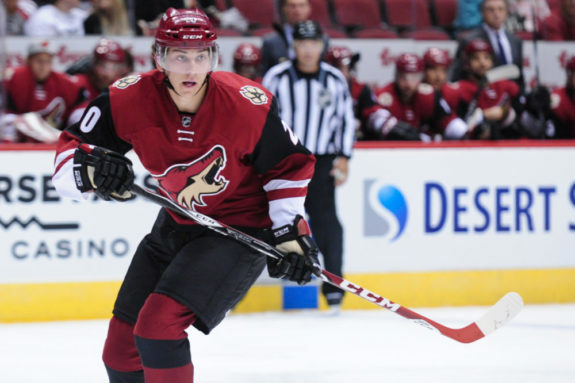 Rookie Dylan Strome came into this season under a lot of pressure to live up to his potential as a third overall draft pick in 2015. So far this season, Strome has underwhelmed. He has had a few shifts where he’s made a good defensive play and one where he was dictating play in the offensive zone. Other than that, he’s been invisible on the ice. Strome has won less than 32 percent of his faceoffs. Coach Tocchet seems to be unimpressed with Strome’s play this season. In the third period of the game against Vegas, Strome only got three shifts and didn’t see the ice in the last 13:14 of regulation. If Strome’s play doesn’t improve, forward Mario Kempe, who impressed in training camp, is sitting in Tucson waiting for his opportunity in the NHL.